One of my favorite questions to ask myself and others is “When was the last time you did something for the first time?” I’m not sure where I first heard this question but it’s a good way to get myself out of a rut. Recently I definitely stepped outside my comfort zone and attempted aerial yoga. What a blast! Steve and I did it together during a getaway to the Inn at Perry Cabin last week on the Maryland eastern shore. We were both “newbies” to the activity and the instructor was more than patient with us and we both got the hang of it pretty quickly. And once you’re confident that the hammock won’t fall from the ceiling, it’s easy to get into some interesting poses and really stretch your body out. If you’re interested in aerial yoga in the Charleston area, my quick research showed Aerial Fit in West Ashley (http://aerialfit.com/) to have a full schedule of aerial classes in a dedicated circus building. I’m not sure Steve and I will be running away with the circus any time soon or joining Pink on her tour, but it was invigorating to do something for the first time. So ask yourself, when was the last time you did something for the first time? ← Congratulations to Daniel Island touring pro Russell Henley! 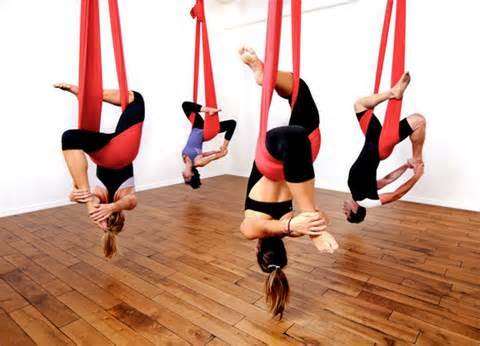 Meg, you are amazing to try aerial yoga. Is that you with the long legs hanging on for dear life?down. Thanks for sharing- you are inspiring! To new adventures! !